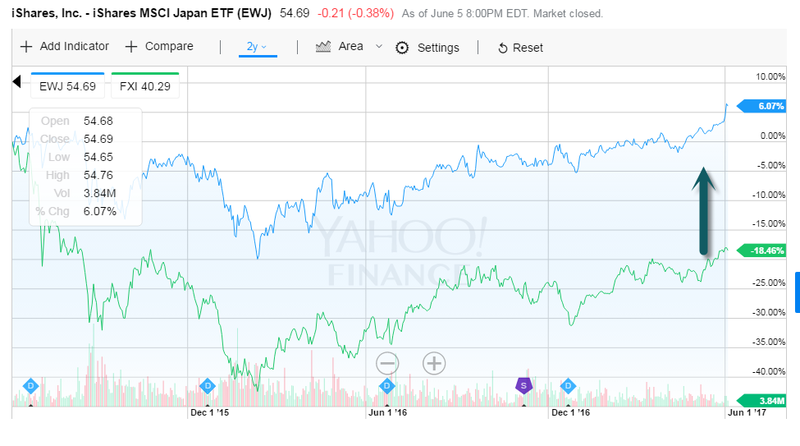 1.EWJ Japan ETF +6% vs. China FXI ETF -18% 2 yr. Numbers. 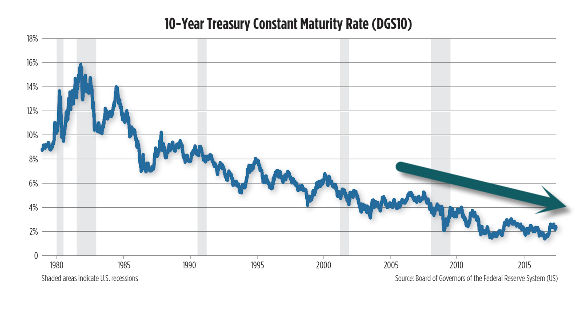 2.Nuclear has been Crushed…Collapsing energy prices and other alternative energy sources have crushed Uranium. 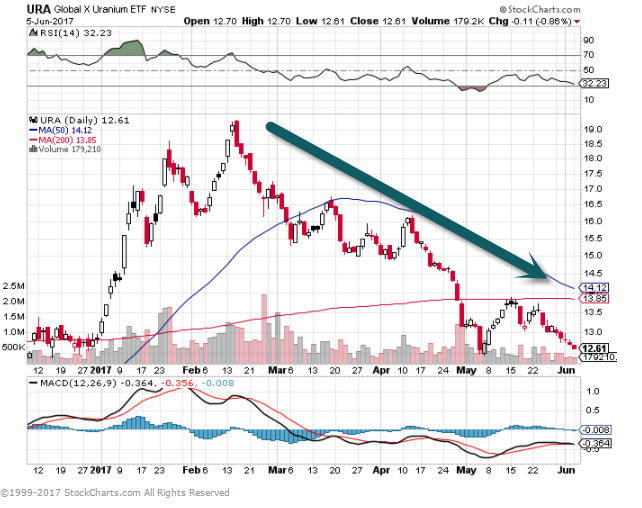 Here’s a closer look at five reasons why uranium prices may move higher from here, and two ways to play the trend. It’s hard to believe it’s already been six years since the Fukushima accident in Japan. Memories of the disaster haven’t faded. But neither has Japan’s need for electricity. So Japanese courts have been clearing the way for reactors to restart. Japan has over 40 working reactors, or nearly 10% of the 447 power-generating reactors in the world, according to the World Nuclear Association (WNA). So as it brings reactors back on line, it will have a big impact on uranium prices. “Japan re-commissioning reactors is very significant,” says Tom Winmill, portfolio manager of Midas Fund MIDSX, +0.81% which invests in precious-metals mining companies. Poor air quality in many parts of China, especially in big cities, has the country looking for ways to generate electricity without burning coal. Another problem for China is that most of its coal is in the north, but its big cities and manufacturing are along the coastline in the south and east. Moving large amounts of coal by rail and barge is getting tougher as power demands rise, says Jonathan Hinze of Ux Consulting, a nuclear industry research group. A big part of the fix to this problem will be greater use of nuclear power and electric cars. “The demand for nuclear energy and solar and green power is going to be massive,” says McDonald. Mainland China currently has 36 nuclear power reactors in operation, 21 under construction, and more about to start construction, says the World Nuclear Association. India, South Korea, Russia and Middle East nations also plan to add significant numbers of reactors. As of February, there were over 60 reactors under construction in 15 countries, over 160 power reactors planned and over 300 proposed, says WNA. Besides the messy pollution from coal and natural gas, it’s easy to see why so many countries are thinking ahead and building more nuclear reactors now. Energy demand will go up 44% by 2030, predicts the U.S. Energy Information Administration. Most of that new demand will come from developing countries. 4.International ETF Flow to Pass U.S. 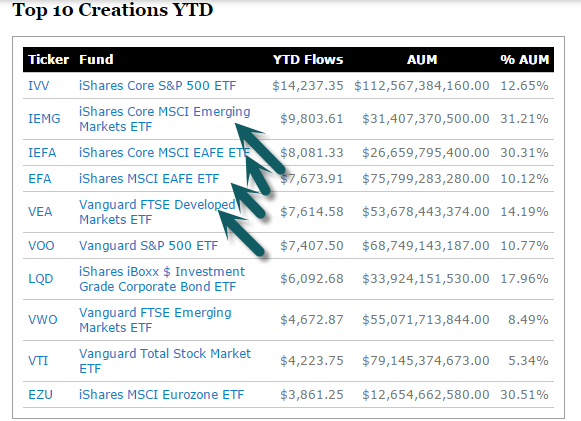 Inflows in May. More telling is that 2017 inflows into international equity ETFs surpassed those of U.S. equity ETFs in May, according to the latest data from FactSet. By the end of the month, year-to-date inflows into the former were $74.6 billion, compared to $68.5 billion for the latter. 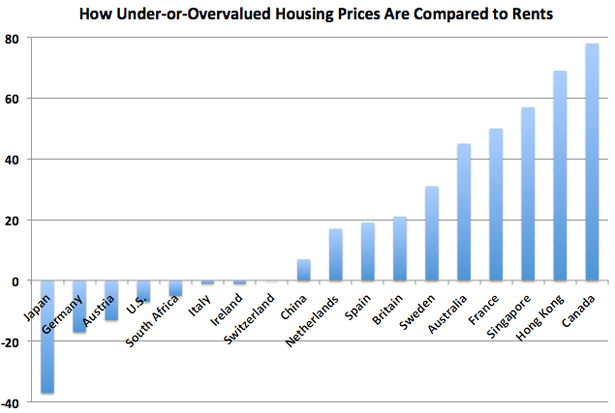 6.Canadian Housing Bubble Finally Popping? New listings soar as sales plunge. Prices drop 6% in just one month. The magnificent house-price bubble in Toronto, which has raised eyebrows even across the jaded asset-bubble world, is hissing hot air. Residential property sales in Greater Toronto plunged 20% in May year-over-year to 10,196 homes, according to the Toronto Real Estate Board (TREB), with sales of condos dropping 6.4% and sales of detached homes plunging 26.3%. And it has already impacted prices. The “TREB MLS Average Price” for all types of homes, dropped 6.2% from April to C$863,910. 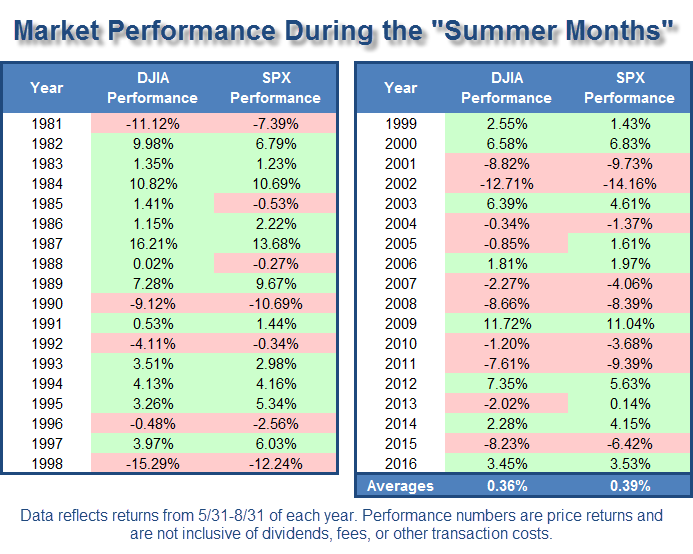 It remains up 14.9% year-over-year, given the crazy surge in prices over the past months, including the 33% year-over-year gain in March, when prices had gone totally nuts! One, Canada’s largest alternative mortgage lender, Home Capital Group, which caters to new immigrants and subprime borrowers spurned by the banks, has been melting down after a run on its deposits that crushed its funding sources. And now the industry is worried about contagion. 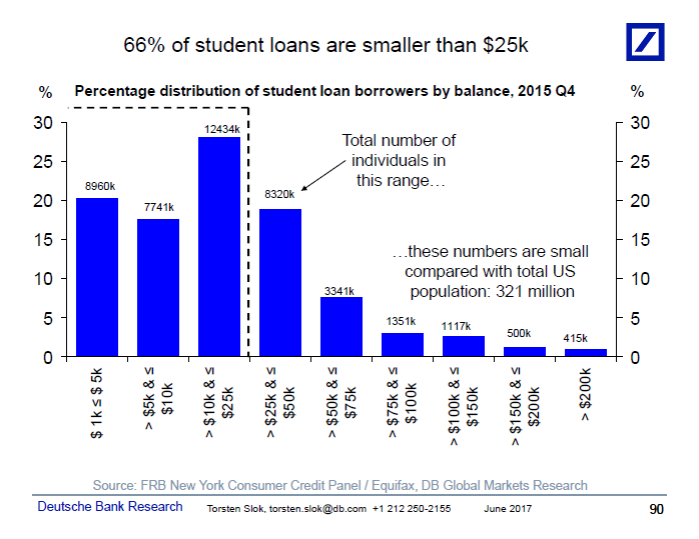 7.Student Loans are not Big Enough to Spark Credit Crisis. On this conference call tomorrow we will be discussing the health of US household balance sheets and the supply and demand for credit and implications for the housing market. One input into this discussion is the issue of student debt, we continue to see this as a micro problem rather than a macro problem, see chart below. Glancing at the headlines, it might seem like drug companies have a hard time avoiding anger over the prices of medications. But public opinions about them have changed in some surprising ways in recent years, especially amid controversies over the high and rising prices of drugs, specifically in the US. A new analysis from the research consulting firm Reputation Institute evaluated public perceptions of 17 pharmaceutical companies in seven areas: products and services, innovation, workplace, governance, citizenship, leadership, and financial performance. These contribute to companies’ “RepTrak” score. The report drew from 16,800 ratings done by people in eight countries, including the US, Canada, and the UK. The report found that on average, drug companies’ reputations have been going up over the past few years. The company with the highest reputation was AbbVie. Young people aged 18-24 tended to have a lower impression of pharmaceutical companies than older age groups. 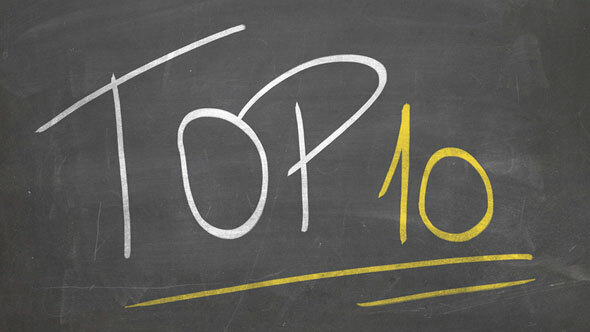 And of the eight countries included in the survey, those in the US had the most favorable view of the industry. Editor’s Note: Memorial Day is an occasion for Americans to reflect on our great nation – and the men and women who have given their lives defending it. Today, we wanted to remind you that our fallen soldiers didn’t make these sacrifices in vain. We think you’ll appreciate this essay on American greatness from Alexander Green’s Beyond Wealth series. It’s not fashionable to talk about America’s greatness these days. Most of us prefer to grouse about the weak economy, the federal debt, political gridlock, stagnant wages, terrorist attacks, racial tension or the state of popular music. There is a sense among many that we are no longer an exceptional nation, that the country is in decline, that the American Dream is over, and that our children and grandchildren face a diminished future. I disagree. And you should, too. American lives have never been longer. (In 1900, life expectancy was just 40 years.) This near doubling of the human life span may be the single greatest achievement in the history of civilization. Our homes have never been larger. According to the Census Bureau, the median square footage of newly built single-family homes is 2,400 square feet. That’s nearly 1,000 square feet larger than the median home built in 1992. The American workweek – at 34.4 hours – has never been shorter. Computers, laptops, tablets and smartphones – which are revolutionizing our lives – have never been cheaper or more powerful. We are the world leader in technological innovation. The internet was created here. If we are no different from the other Western democracies, why were transformative companies like Apple, Google, Facebook, Amazon, Twitter, Tesla and Uber – to name just a few – all founded here? 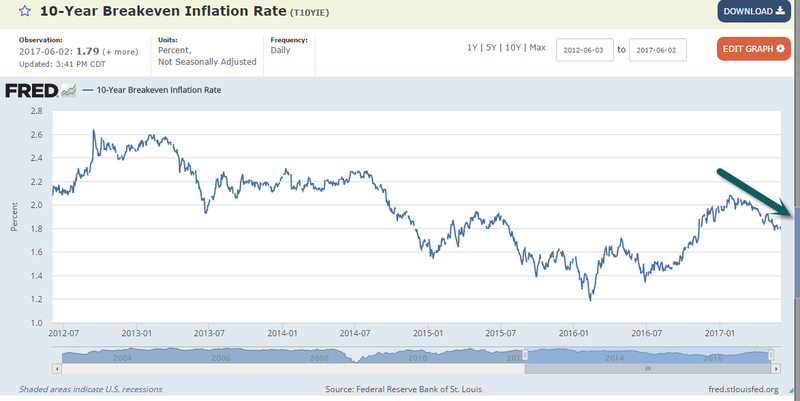 The essentials of life – food, clothing, energy and shelter – (in inflation-adjusted terms) have never been more affordable. All forms of pollution – with the exception of greenhouse gases – are in decline. American agriculture is the envy of the world. Our farmers now grow five times as much corn as they did in the 1930s – on 20% less land. The yield per acre has grown sixfold in the past 70 years. For decades, experts warned us that we had to end “our addiction to foreign oil.” Yet thanks to new technologies like hydraulic fracturing and horizontal drilling, we surpassed Russia in 2013 to become the biggest energy producer in the world. The U.S. leads the world in science, engineering, medicine, entertainment and the arts. No nation attracts more immigrants, more students or more foreign investment capital. Americans are the most charitable people on earth, both in the aggregate and per capita. The Giving USA Foundation reported last month that U.S. charitable donations rose 4% in 2015 to $373.25 billion, a new record. The dollar is the world’s reserve currency. Americans are just 4.4% of the world’s population, yet we create nearly a quarter of its annual wealth. Our economy is No. 1 by a huge margin. It is larger than those of Nos. 2 and 3 – China and Japan – combined. And the Federal Reserve reported that last quarter, U.S. household net worth just hit an all-time record, at nearly double the 2000 level. Despite this good fortune, polls show that Americans are less optimistic about the future today than in 1942, when we were in the fight of our lives against Hitler, Mussolini and Hirohito. But enough about the present. Let’s also take a look at America’s past. Our Declaration of Independence is a timeless statement of inherent rights, the true purposes of government and the limits of political authority. Our core beliefs are enshrined in the Constitution and Bill of Rights, the longest-serving foundation of liberty in history. Technical analysis is the study of price and volume activity in the stock market, and there are three powerful tools that will help you find buying opportunities in the market. Any investor can become a technical analysis pro by using these simple buy and sell indicators. We’ve also done the research for you and found five stocks hitting these urgent buy signals right now. Our nation’s growth and prosperity have been extraordinary. How did our small republican experiment transform and dominate global culture and society? Entrepreneurs were given free license to innovate and create. Profit was never something to apologize for. Rather it was viewed as proof that the businessman offered customers something more valuable than the money they traded. Historically, we have opened our arms to tens of millions of immigrants who dreamed of a better life and helped to build this country. In the process, we developed an astounding capacity for tolerance. Today, we live peaceably alongside each other, unperturbed by differences of religion or ethnicity. I’m not suggesting that other nations don’t have proud histories, unique traditions or beautiful cultures. I’m delighted when I get a chance to visit Hong Kong or Buenos Aires, not to mention Paris or Rome. There’s a lot to love about day-to-day life in other countries. But people around the world don’t talk about the French dream or the Chinese dream. Only one nation is universally recognized as the land of opportunity. That’s because America cultivates, celebrates and rewards the habits that make men and women successful. Anyone with ambition and grit can move up the economic ladder. Everyone has a chance to improve his or her lot, regardless of circumstances. It’s a good reason to maintain a positive outlook. And I’m in pretty good company here. American GDP per capita is now about $56,000. That – in real terms – is a staggering six times the amount in 1930, the year I was born – a leap far beyond the wildest dreams of my parents or their contemporaries. U.S. citizens are not intrinsically more intelligent today, nor do they work harder than did Americans in 1930. Rather, they work far more efficiently and thereby produce far more. This all-powerful trend is certain to continue: America’s economic magic remains alive and well… The babies being born in America today are the luckiest crop in history. American ingenuity, technology and capital markets are creating dramatic improvements in communications, transportation, manufacturing, computing, retailing, food production, construction, healthcare, finance, pharmaceuticals, robotics, sensors, artificial intelligence, genetics and dozens of other industries. We can’t even imagine all the fantastic innovations that lie ahead of us. The notion that America is exceptional is not, as some would argue, just a crude strain of patriotism. Our country embodies timeless ideals, an optimistic attitude and an enthusiastic endorsement of the pursuit of happiness. What should you celebrate about America this weekend? Try this: We are living longer, healthier, safer, richer, freer lives than any people in the history of the planet. Yes, we face plenty of problems and challenges. And there are bound to be setbacks ahead. But for this weekend at least, let’s celebrate how far we’ve come. Our regular financial content will resume tomorrow. We all know sales success doesn’t just happen overnight. Luckily, there are a few secrets to close deals faster, meet quotas quicker, and grow your team with ease. For any sales leader, data should be running the show — however, only 0.5% of available data is taken advantage of, as the sheer volume often intimidates many teams. Many believe that only large enterprises have the resources to utilize big data, yet small businesses can easily take advantage of it, as well. Because the information surrounding a prospect helps you make or break a deal, here are 5 Golden Rules to ensure your team is well on its way to increase sales. For any growing business, getting organized immediately sets you up for success. If you have an email address for one person, a Twitter handle for another, and a LinkedIn connection with another, it’s time to consider putting everything in one place. Having a broad network is amazing — but if your contacts aren’t organized, you risk losing some really important business relationships. Once your contacts are organized, ensure your reps are in line, as well. Sales process may be one of the most overused terms used by businesses today, but it’s important for you to have a clear understanding of what yours looks like. While every business is different, most follow a progression with comparable sales stages. From lead to close, to onboarding and beyond, make sure your sales process is repeatable and that it can be optimized for success. Building a sales culture of transparency and accountability is a new concept for most sales teams. An open culture of communication makes for happier employees because everyone knows what is happening and why. In an environment filled with strong personalities, this can be a difficult thing to accomplish — however, technology makes it easier. To make analytics part of your daily operations, you must view them central to solving problems and identifying opportunities. You must also possess the muscle to transform your organization so that data and models actually yield better decisions. At the end of the day, data means nothing if you’re not able to turn it into actionable insights. Excited to go back to your desk and get started? Start by researching a CRM. From there, evaluate your sales process — and if you don’t have one, figure out what will make your team most productive. Finally, determine which metrics that matter most, and how you can maintain visibility among your team. Apply these Golden Rules, and you’ll be selling more in no time!